Here’s some more information on the Advanced Enviro-Septic (AES) Wastewater Processing System we wrote to you about previously. Installations are now taking place in most parts of NZ as the advantages of no power, no servicing and nothing to go wrong are picked up by end users. Home owners, large commercial installations, designers and drainlayers can see the advantages of no risk margins using locally-sourced products with almost no chance of call backs. We are keen to see more of you involved as installers so we can refer potential clients to you as enquires are received from around the country. Advanced Enviro-Septic (AES) is a Back to the Future system using a locally-sourced septic tank followed by AES pipes in a sand bed. The Internationally accredited result is effluent treated 10x better than that required for secondary treatment by AS/NZS 1547:2012. without the use of power or chemicals. There are no electrical components or moving parts, there is no on-going maintenance required other than the usual periodic emptying of the septic tank and ensuring the low level air entry vent at the treatment bed is kept clear of vegetation. 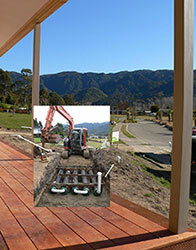 The AES pipes installed in the sand bed are lightweight and flexible. They can adapt to any site shape – straight or curved, even multi-level configurations in order to minimise the area of the treatment bed. They also provide a large surface area within the pipes for aerobic bacterial activity. The sand bed can easily follow contours and avoid obstacles. The pipes are installed in System Sand – coarse, clean sand, similar to 2A or concrete sand, even crushed glass if it meets the specs. The effluent is then dispersed into the soil beneath the bed, or collected and used for irrigation if that is required. Intermittent use is easily accommodated by quick start-up after periods of non-use. 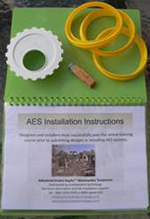 AES can be retro-fitted to existing septic tanks and can be used with any locally sourced tank. The system was developed by Presby Environmental in the USA where it has been in use for over 25 years with over 250,000 installations. 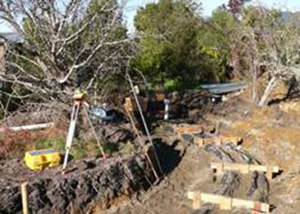 Drainlayers need to complete the on-line course if they wish to install Advanced Enviro-Septic™ systems and Designers are encouraged to use the course to familiarise themselves with the relatively simple design parameters. Environment Technology is here to provide ongoing support, review designs and to answer any queries you may have.